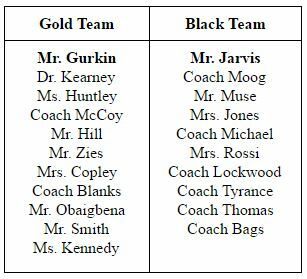 The Gold Team won 54 to 44 against the Black Team during Staffsketball on Feb. 24. There was not a dull moment during the game from the lighthearted humor of the teachers and announcers to the cheers of the crowd and cheerleaders. 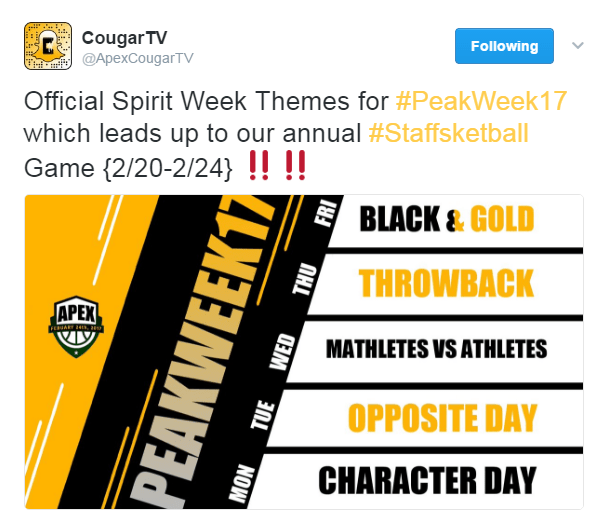 Talk of Staffsketball started at the beginning of the school year and was officially announced on CougarTV along with Peak Week 2017 and the final pep rally at Apex High School. 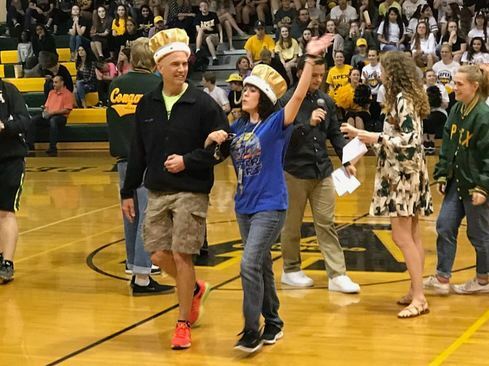 The video showed a sneak peek of participating teachers and staff, as well as the team captains; Mr. Gurkin headed the Gold Team and Mr. Jarvis lead the Black Team. CougarTV led the coverage leading up to Staffsketball, releasing official commitments to both teams. Peak Week 2017 ended with an action-packed pep rally that began with an introduction of the spring sports teams and the Staffsketball teams. Additionally, the Staffsketball Court was announced and battled students in a relay race for free tickets to the game. During halftime, Coach Cooper and Ms. Whiteside were named King and Queen. The Staffsketball game began with a bang by introducing the teams through a video in which players stated their name and school. The announcers for the game were Mr. Apex Keaton Williams and Homecoming Queen Sadie Harding sporting retro Apex varsity jackets. This year featured teacher cheerleaders who performed at the beginning of the game and during halftime. The game began with players going in the stands, tossing the ball to spectators, and stealing the microphone from the announcers. After the first few baskets, the game became more serious. By the end of the game, the lighthearted humor returned with the crowd cheering for Mr. Gurkin to make a basket; Mr. Gurkin even took the opportunity to promote physics. Staffsketball 2017 elevated what we all knew from last year.